People can enjoy chess on different levels. Sometimes the beginner gets greater pleasure from the game than the grandmaster. Some play the game for the competition, while others enjoy the artistic aspects of chess. I like both! It is one of the best ways to break through age barriers and socialize. It's music to my ears when my students say: "I played a game against Grandpa on the weekend!" Playing in simultaneous exhibitions is a good way of sharing the fun with everyone interested in the game. If you'd like to organize such an event in your community or organization, please feel free to contact me. One of the things I like most about chess is how it can bring people together. It's like a magic bridge that makes connections. It doesn't matter where you come from or what you look like. You don't even have to speak the same language to enjoy chess! One can appreciate the poetry of the game without words. On the chess board and in life, we have to think before we make our decisions. There are consequences to every move we make. Read about some of the benefits here. Most my online students are grown-ups who used to play a bit in their childhood, but due to school, work and other obligations, didn't have the time to play and improve their games. 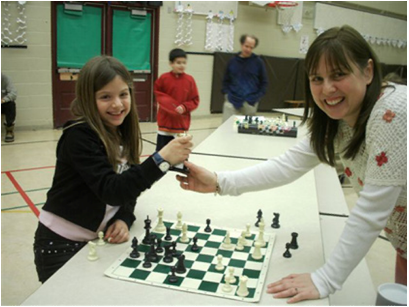 I can help them gain a better understanding of chess, enhance their enjoyment and improve their skills. To schedule a private lesson contact me.